The 2014 OEP Conference is officially in the books and we at the OEP would like to thank all of our speakers and attendees for making it a great day! In case you missed the conference, we will be sharing photos, videos and other conference information in this blog post “recap” of events. This year’s theme was: Diplomas, Certificates and Degrees: Helping Arkansas Students Find Their Ideal Careers, and our focus was on college and career readiness. You can visit our conference website to access all of the speakers’ presentations and YouTube to view videos of the conference. Gary Ritter, Director of the Office for Education Policy, opened the day by sharing our inspiration for this year’s theme, which is related to the “forgotten half,” those students who do not go on a four-year college. 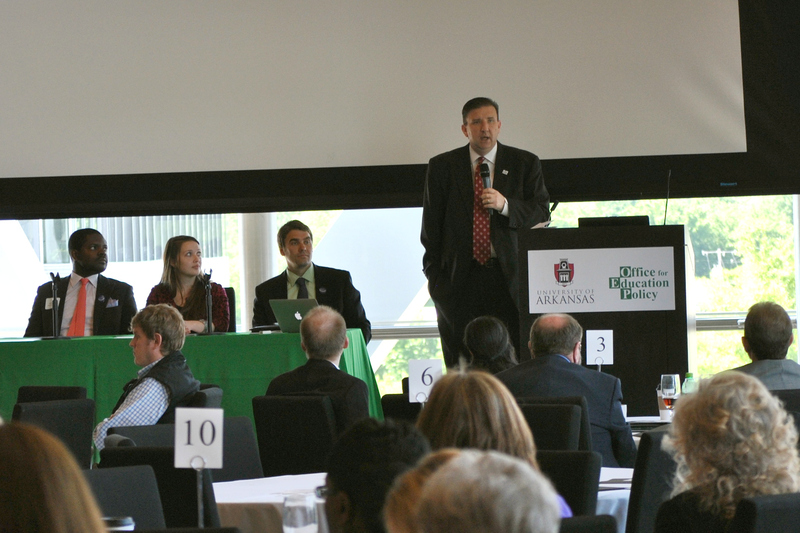 Ritter went on to say, “If we act as if four-year college is the only way to go, we’re clearly neglecting a large fraction of our kids.” The rest of the program focused on strategies being used at the state and national levels that seek to prepare ALL students for both postsecondary and career opportunities. 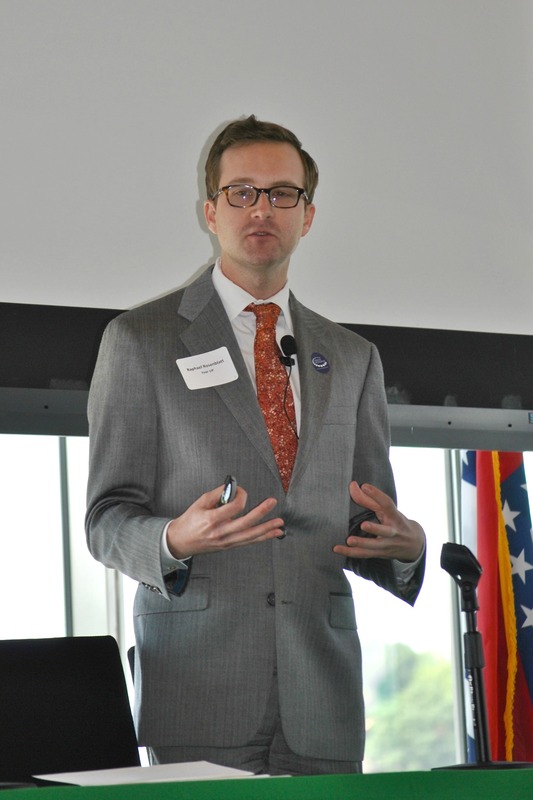 Matt Dozier explained that EAST Initiative is using “21st century tools to solve 21st century problems” by engaging students through the use of student-driven, technology-focused projects. For example, Harrisburg Middle School helped research and create a map of tornado sirens for their community. View the presentation here and the video here. Matt McClure discussed the New Tech high school model and provided some keys for success in implementing the model: faculty buy-in, educating parents and the community, providing professional development activities and release time, and sending faculty members to become New Tech Certified Coaches. View the presentation here and the video here. Ken James from Arkansas AIMS provided evidence that Arkansas AIMS is boosting the number of Arkansas students taking Advanced Placement (AP) courses and, in turn, increasing the number of students achieving qualifying scores on AP exams. View the presentation here and the video here. Next came the presentation of the 2013 OEP Awards, honoring those schools who performed well, “beat the odds” and improved on the Benchmark and End-of-Course exams. 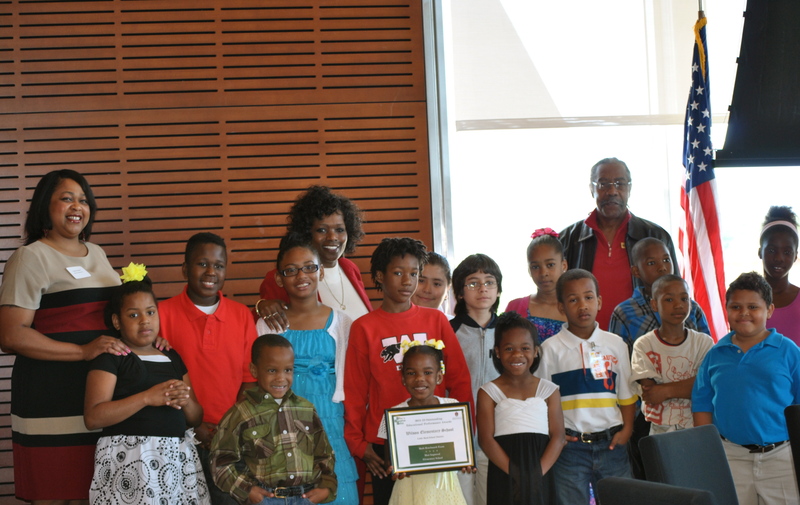 A highlight of the awards ceremony was the presentation of the award “Most Improved Elementary School in Math” to Wilson Elementary of Little Rock. Wilson Elementary’s Tianka Sheard brought several K-5th grade students with her and spoke about how proud she was of the students for their improvement in their math achievement over the past few years. The crowd at the conference rose to honor Wilson Elementary with a standing ovation. View the OEP Awards presentation video here. 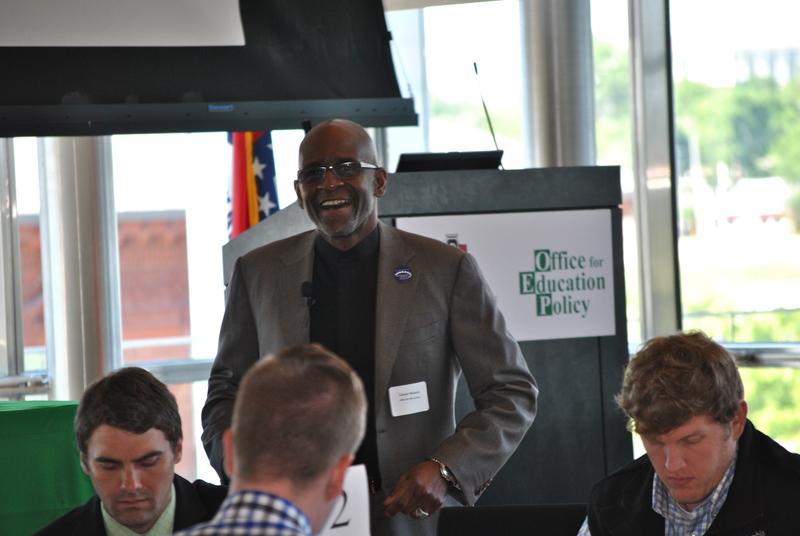 Our first national speaker was Caesar Mickens from Jobs for the Future, who presented an interactive workshop on the Early College High School model. Participants worked in their table groups to gain an understanding of the design elements of the model, such as the provision that allows students to earn their high school diploma and college credits, including a possible Associate’s degree, at the same time. According to Mickens, “We really concentrate on first-generation college students, low-income students, minority students.” Mickens said middle-class and upper-class students typically have parents who motivate them to push themselves academically, while students in the groups his organization targets often do not. An additional advantage of the model is that early college high schools can help students adjust to the rigor and culture of college before they actually make the leap. Table groups also brainstormed on how this model could work in their own community in Arkansas. View the presentation here and the video here. 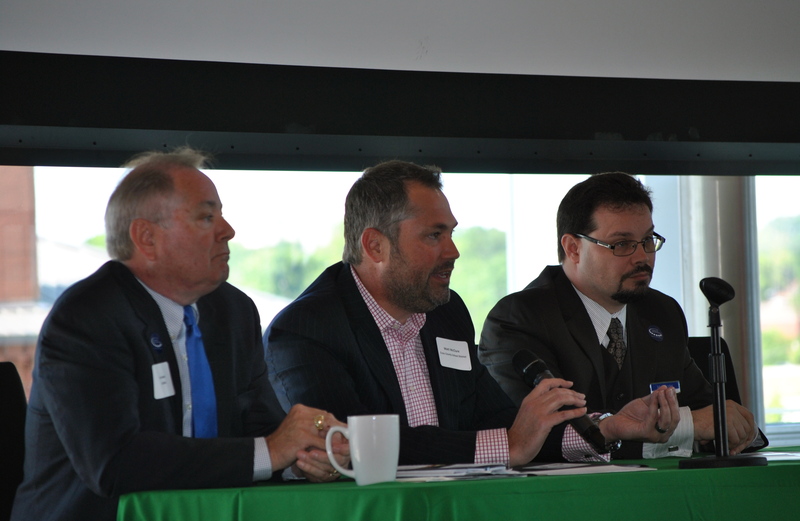 Shane Broadway’s presentation featured Arkansas Works, a state program that helps people get ready for jobs. Errin James, an Arkansas Works career coach who works with students at Augusta High School, said his school is starting to develop partnerships with local factories, “The biggest thing I’m taking away today is to bring better partnerships between the local businesses and the high school to get more input from manufacturers so our kids after high school will be ready to go straight to work.” View the presentation here. Razor C.O.A.C.H. is modeled after Arkansas Works, and places career coaches in 15 Northwest Arkansas high schools to help students determine their path after high school. A big part of the program is helping students navigate applications for college, financial aid and scholarships. Additionally, this year the program took more than 150 students and parents to visit the University of Arkansas at Fayetteville because most of them had never been on a college campus before. View the presentation here. The College Initiative is a program developed by Gabriel Fotsing that operates in the Delta region and helps students apply to and succeed in college. Fotsing stated that while many students do not know much about how to get to college, they have the potential to succeed once they get there. The College Initiative seeks to provide these students with guidance for the transition from high school to college. View the presentation here. Similarly, Mary Ann Shope, indicated that skilled workers such as electricians and welders make good wages, and their jobs are often recession-proof. Students that attend these programs at community colleges such as Pulaski Technical College, the state’s largest, also usually incur much less student loan debt that those students that attend four-year colleges. 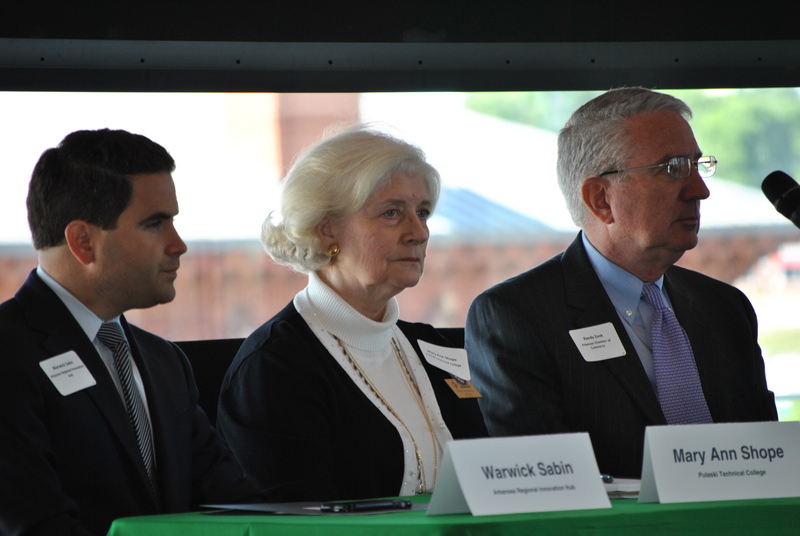 Warwick Sabin urged that Arkansas needs to consider the needs of today and the future. He stated, “We need to direct efforts toward innovation & creativity.” Sabin advised that his organization has found an excellent educational partner in the EAST Initiative, as the combination of cutting-edge technology tools and entrepreneurial ideals work well together. Students aren’t leaving high school with the skills needed to succeed in the work force. Students’ skills and knowledge aren’t aligned with the needs of today’s job market. The notion that high school students move directly into attending four-year college full-time is not feasible for most. Teens who work or enroll in career exploration programs benefit in many ways such as better grades, lower dropout rates, lower teen birth rates and less involvement with the criminal justice system. Establish what it means to be both college AND career ready. Challenge to teachers: Make time to incorporate four career experiences into your teaching so your students understand what comes after high school. Challenge to administrators: Work to reduce the barriers that limit conversations between these stakeholders. Improve utilization of school counselors. Challenge to counselors: Work with high school students to develop 6-year plans that focus on both college and career readiness. We at the OEP are hopeful that this year’s conference initiated some important conversations about the challenges facing Arkansas high schools as they prepare today’s graduates for the jobs of tomorrow. As Gary Ritter stated, “The idea is to bring people together to discuss a common problem and discuss varying solutions to that problem and perhaps ideas will stick with some people.” Let us know what you thought of this year’s conference in the comments section or by emailing us at oep@uark.edu!